Quilters/sewers are know to be… collectors. Of all things sewing-related. I admit to this. Now, unlike most quilters, you might be quite surprised that I don’t collect as much fabric as most others do. My stash is quite humble, and therefore manageable. But I do collect lots of other things: buttons, beads, threads, ribbons, needles… you name it. Oh, yes… and presser feet. I have several sewing machines, and for each of them there is a presser foot collection. The sewing machine I first learned to sew with is a Singer 404 (manufactured in 1958). It is a workhorse, and although I don’t use it a lot anymore (only has a straight stitch), it is still my favorite when it comes to heavy-duty sewing. The feet it came with look pretty different than those on more modern sewing machines. And as I started to learn to quilt, with some patience I was able to find the generic feet I needed for this purpose: walking foot, free-motion quilting foot, and 1/4-inch foot. This machine served me well in my early quilting years, when I basically machine pieced and hand quilted. I did start learning to free-motion quilt on this machine. On the bottom row, you can see the three different feet purchased for this purpose. It got me started, enough to get me hooked, and also to realize I needed more in a machine. Enter the Singer 2630C. Still a pretty basic mechanical machine. But I now had a zig-zag stitch and several decorative stitches. Oddly enough, not as many feet as the older machine, and I was soon to find out it wouldn’t be easy to find a variety of feet for this machine. Still, quite a sturdy machine that I still use off and on for projects like fabric bowls or boxes that require some heavy-duty sewing. As I became more and more interested in free-motion quilting, I eventually decided to purchase an industrial (Singer) sewing machine, primarily because of the larger bed, the higher speed (even though I did have it adapted to a slower speed), and because the only reliable technical support available to me locally has been for Singer and Brother sewing machines. There aren’t many feet available for this particular industrial sewing machine, but I still have a few… including one that was adapted (the first one) for free motion quilting. Then came a series of Brother sewing machines. And the best part is that I was able to continue adding to my pressure foot collection, as I have been able to continue using the new ones with each successive sewing machine. Believe it or not, I don’t own them all… yet. 🙂 Just give me a little time! So far, my favorite has been the cording foot… I actually have two different ones! Singer has an excellent page with some short instructional video clips. 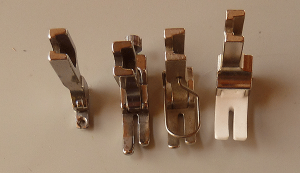 Even if you don’t have a Singer sewing machine, you might want to check these clips, because they apply to just about any sewing machine. 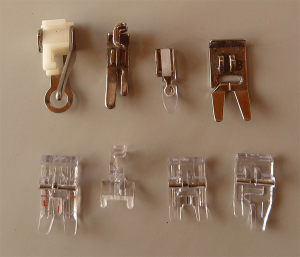 In some cases they have more than one clip for a given presser feet, just to give you ideas of the different ways in which it can be used. Nancy Zieman also has three excellent videos on some specialty presser feet. The first video covers the Invisible Zipper Foot, Roller Foot, Walking Foot, and Satinedge Foot. The second video is about the Stitch-N-Ditch Foot, Teflon Foot, and the Flower Stitch Foot. And the third video includes Bias Binding Foot, Buttonhole Foot, Sequins ’n Ribbon Foot, and the Free-Motion Quilting Foot. Each video is just under half-an-hour long, so between the three you get a pretty well-packed class. In Sewing Machine Feet from A to Z, instructor Steffani Lincecum teaches how to identify and use 11 of the most common sewing feet, including zipper and buttonhole feet, blind-hem and rolled-hem, and other optional feet that help you achieve perfect topstitching, gathers, couching, free-motion stitching and more. Excellent. Amy Alan (love her classes!) offers a free mini class called Sew Ready: Machine Basics, with everything you need to know about the use and care of your sewing machine. In Lesson 3 she covers specific feet, with stitched out samples you can refer to as a visual reminder. Creativebug also offers a mini class on some specialty feet. Sew Mama Sew offers a good guide of some feet, especially for those interested in quilting, including an adjustable guide foot I hadn’t seen before. 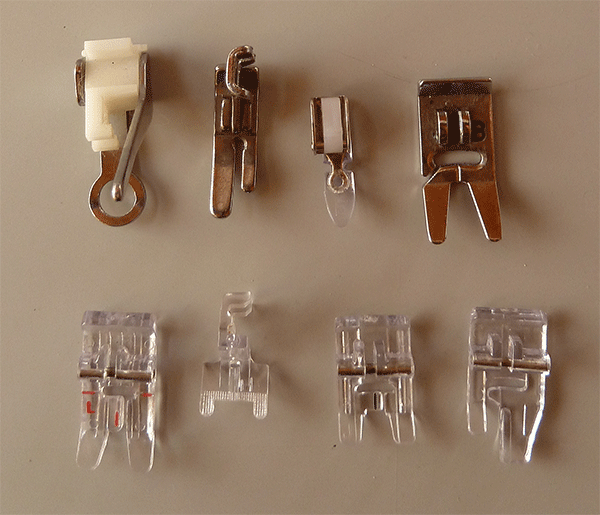 Other feet include: standard presser foot, walking foot, integrated waling foot, quarter inch foot, and open toe applique foot. Sabrina Student Designer provides a really good presser foot cheat sheet, that includes some generic feet that can be used on a variety of sewing machines. 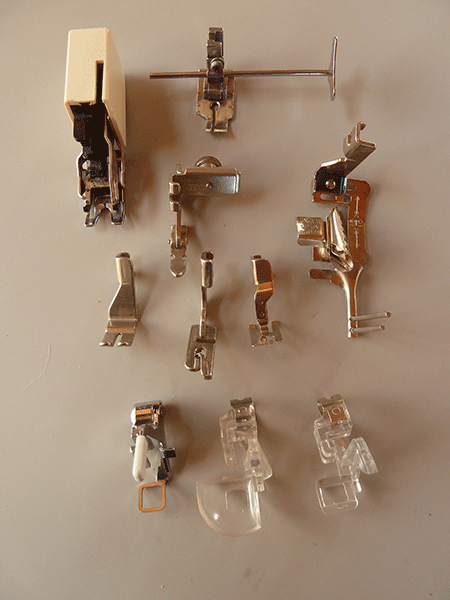 Some of the specialty feet included here that you might not have found reviews for are: satin-stitch or monogramming foot, edge-joining foot, binding foot, adjustable bias-binder foot, hemmer foot, picot edge foot, felling foot, pintuck foot, cording foot, and welting foot. The Sewing Machine Attachment Handbook : this is a great resource if you have an “older” or vintage sewing machine. Lots of illustrations to help you identify 25 different feet. Plus some good all-over tips on sewing machines in general. 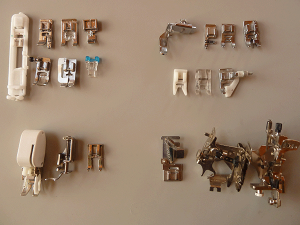 My all-favorite is The Sewing Machine Accessory Bible: Get the Most Out of Your Machine—From Using Basic Feet to Mastering Specialty Feet . This is the most complete guide I have been able to find on presser feet. Besides the feet mentioned above in the other resources, this book includes information on modern feet, like beading and braiding feet, the flower attachment, chenille foot, candlewicking foot, and circular sewing attachment. Believe it or not, I could go on and on. 🙂 There are many other resources out there, but I hope this short list gives you a place to start. And, if you haven’t done so yet, I encourage you to get your presser out and start learning how to use them all. They really do make sewing easier! I thought they made all these gadgets so we COULD collect them! And as they are part of a collection we don’t have to use them!